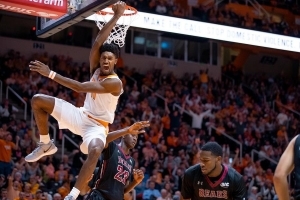 KNOXVILLE, Tenn. – All five of Tennessee’s starters scored in double digits as the Vols rolled to a 86-41 season-opening victory over Lenoir-Rhyne in front of a crowd of 16,156 at Thompson-Boling Arena Tuesday. The sixth-ranked Vols built a 20-point halftime lead before opening the second half on a 19-0 run over the first 8:47 of play to put the game away. In the second half, Tennessee held Lenoir-Rhyne to 11 points on 4-of-32 (12.5 percent) shooting during the period. Jordan Bone led Tennessee (1-0) in scoring with 18 points on 8-of-12 shooting to go along with six boards and three assists, followed by a career-high 16 points from Kyle Alexander. Alexander also added five rebounds and four blocks. Grant Williams and Admiral Schofield both chipped in 13 points. Williams finished with seven rebounds, five assists, two blocks and two steals. Schofield tallied a game-high nine boards and four assists. Jordan Bowden recorded 11 points and a game-high six assists. Cory Thomas led the Bears in scoring with seven points. Lenoir-Rhyne started the game hot from 3-point range, hitting six of its first 10 attempts. All of the Bears’ first 18 points came by way of 3-pointers. Tennessee built an early lead, but the Bears cut that lead to 20-18 on a Jalen Johnson 3-pointer, their sixth converted three of the first half. The Vols quickly responded, however, coming out of the timeout and executing a quick, 13-2 run that featured three forced turnovers in a 40-second span to push the lead back to 13 points. From there, Tennessee gradually built on its lead before ending the first half on a 13-4 run, taking a 50-30 advantage into the break. Tennessee’s 50 first-half points marked the first time the Vols reached the half-century in a half mark since Nov. 14, 2017. Bone and Alexander both reached double-digit scoring in the first half with 12 points apiece. HOME OPENER ATTENDANCE: A crowd of 16,156 witnessed the Vols’ opening night win over Lenoir-Rhyne. It marked the largest home-opener crowd at Thompson-Boling Arena since 2012. VOLS TALLY 11 BLOCKS: Tennessee blocked 11 shots during Tuesday’s triumph, the most blocks in a single game since having 11 on Dec. 23, 2013, against Morehead State. Kyle Alexander led the team with four blocks, Yves Pons added three, Grant Williams had two and Jordan Bowden had one. 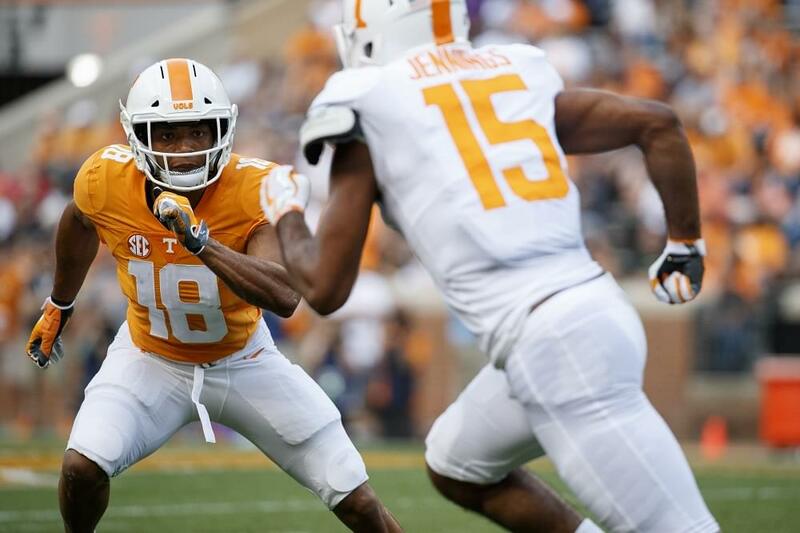 LOCKDOWN SECOND HALF DEFENSE: Tennessee held Lenoir-Rhyne to just 11 second-half points during Tuesday’s win, which was fewer than any UT opponent managed during a half last season. After starting the game 6-for-10 from 3-point range, the Bears finished the game 1-of-25 from beyond the arc. Of the 11 Lenoir-Rhyne players who attempted a shot in the second half, only three made a basket. Overall, the Bears finished 4-for-32 (12.5 percent) from the field in the second half. PONS FILLS THE STAT SHEET: Sophomore swingman Yves Pons got it done in several statistical categories, setting several career-highs. Pons finished the game with seven points (on 3-of-4 shooting), five rebounds and three blocks. In 21 minutes of play, the Fuveau, France, native finished with a plus-minus rating of +31. WILLIAMS RECORDS 50TH DOUBLE-DIGIT GAME: Junior forward and reigning SEC Player of the Year Grant Williams logged his 50th career double-digit scoring game with his 13-point performance against Lenoir-Rhyne. Dating to last season, Williams has scored in double digits in seven straight games. The Charlotte, N.C., native scored in double figures in 29 of 35 games as a sophomore last season. UP NEXT: Tennessee returns to Thompson-Boling Arena on Friday at 7 p.m. ET for its second home game of the week as it hosts Louisiana. The game will be streamed online and viewable worldwide through SEC Network+ (WatchESPN).